So here begins the story of the dramas with the rear end. Over a coffee Paul explained that how the nomad was currently set up with the four link, nine inch diff and coil overs the car would be undriveable. 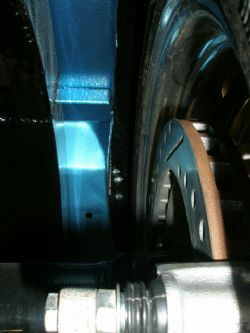 I had already witnessed the car come to earth from the hoist and clearly there was no movement in the rear suspension. I had also noticed two not so nice dents and scratches in the paintwork on the floor pan above the mounting points for the four link. Not happy! Have you ever a followed a car and it appeared that the car was crabbing down the road? The front wheels don’t align with the rear wheels and you suspect it has either been hit hard or the wheel alignment technician got it wrong on his first day on the job. That’s what the nomad would do if let loose on the street. The first stuff up comes with the diff, prepared by Outlaw Speed Shop in Adelaide. If you remember this caused me major dramas – quoted three weeks lead time and received it five months later. It appears that they know nothing about geometry as well as the brackets to mount it to a 57 frame were not square and the additional brackets I supplied specifically for the four link were welded incorrectly also. This is part of the reason why it would crab down the road. 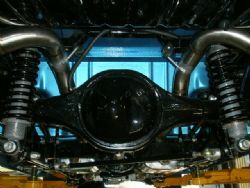 The second stuff up was by Quickfit Motor Sports and the way in which they welded and bolted the four link together. None of this was square and the coil overs are not at the same angle on either side when viewing if from the rear. The third and monumental stuff up was by Quickfit Motor Sports again and left me gob smacked. 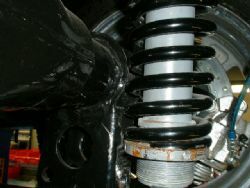 The springs surrounding the coil overs (see photo 1) on both sides are wedged hard into the diff housing which allows no movement whatsoever. After so many stuff ups I feel like a right dill for not picking it up and yet there must have been thirty plus people look and comment on the underside of the car. None of those people, many in the trade, picked up the springs wedged on the diff housing or the gaps either side on the inside of the rear wheel arches. 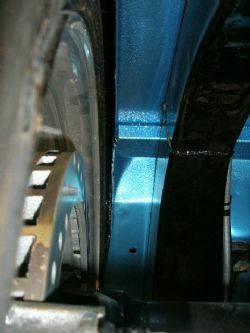 The left side (photo3) is real close and would rub if going over a speed bump (provided you had movement in the suspension in the first place) and the right side (photo 4) has a good gap. The fix – you guessed it, throw money at it and get it done right. The entire rear end will have to come out of the car, the diff needs to be centred, all the brackets that have been welded on will have to come off and be set up properly and longer springs and coil overs will be required to provide adequate suspension travel. Lead time on that? I’m off for a drink, watch this space….